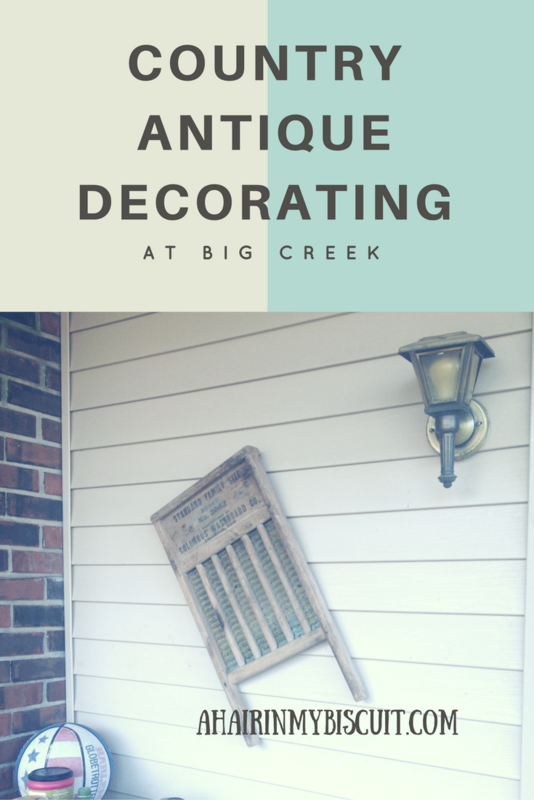 I’ve waited a long time to share our country antique decorating style here at Big Creek, and the day has finally come to show off our hard work! “Big Creek” is our 115-year-old farmhouse, which Coach and I have spent the past 2 years remodeling and restoring back into sound shape. We’re *almost* done, and I’m so excited about it that I wanted to share our country antique decorating ideas with you, my treasured readers. Not only will I share our decorating style with you, but I’ll also tell you where to find similar pieces for yourself. One final touch to the house was completed just two weeks ago. We had the 30-year-old wallpaper painted! It was only coming down at the seams a bit, but it was so dirty looking…we are thrilled to have this part done! It looks so clean and pretty, and we are loving the color (it’s called oatmeal, and it’s from Glidden). Our original plan was to replace the wallpaper (read about that here), but painting it was a much better option. I don’t want to hang wallpaper, and I couldn’t find anyone else who wanted to, either! Let’s begin with a little history, so you can get caught up with our progress and see for yourself where we started, and how far we’ve come. Our farmhouse decorating style has evolved over the course of our two years here with each improvement that we’ve made. The best way to share that is to send you to past posts on this blog, because I’ve documented our progress along the way. If you get through all the following links, you will have killed your entire Christmas holiday, but they’re all worth reading (or at least looking at the pictures)! Start here: There’s No Place Like Home, then Big Creek. Those posts are where you can get the full history of Big Creek, and how it came to be ours. I feel so fortunate to have the opportunity to live in the home I grew up in, and to keep the history alive in this restoration. Next, visit here: Rough House. This one will give you some idea of what we had to work with when we moved in. Madre and Papa poured their own blood, sweat and tears into this old house for years, and they certainly kept it from falling in around them, by the hardest. Our decorating theme is a mixture of antique farmhouse decor and modern pieces, with some rustic farmhouse decorating thrown in the mix. Our country antique decorating ideas came from our love of all of the individual pieces we have, and we’ve tried to mix them up in a way that pleases us. Lots of the pieces in our home have been here longer than we have, and were passed down for generations, which means we have lots of vintage farmhouse decor that we didn’t have to pay an arm and a leg for. I’m going to start with the antiques and the vintage pieces in this post, then move on to the rustic and some of the more modern stuff that tickles our fancies in a future post or two. Another favorite antique is something I actually have two of…my Hoosier cabinets. Both of mine are in pretty rough shape, but they serve their purpose for me, and I’m very happy with the way they look. The one in my kitchen (left) holds all of our home-canned goods, along with a few crystal pieces I love, and my pitcher collection. It also holds medicines and various other things, so it’s very functional as well as just looking good in my kitchen! The Hoosier cabinet in my studio (right) holds even more than the one in the kitchen. 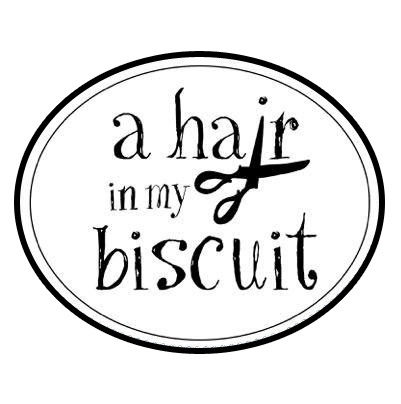 The upper cabinet and bottom drawers are absolutely full of supplies for my handmade business, and the bottom cabinet is home to all of my hair supplies that I brought home from the salon when I left last year. I try to keep the open shelving a little neater, and use it to display some of Coach’s fan gear (Roll Tide!). Please note that the picture on the right was taken right after our sun room remodel, and before I had really gotten my studio put back together. I would rather die than to show you a picture of that cabinet as it looks right now…the studio looks like a cyclone went through it after the Christmas rush! Both of these old Hoosier Cabinets were given to Madre by my cousin, and I’m sure sweet cuz would gladly take them back at any time (I’m sure because she’s said, ‘if you ever get tired of those, I’ll take them back!”). These cabinets are in high demand, and can be found in lots of different price ranges, depending on what condition they’re in. Here’s one on Etsy that seems to be in excellent condition! In the hallway you’ll find my wash stand. This is a true antique piece, not one of those replicas that you find in junk stores. It’s a solid, heavy piece of furniture! I don’t have the traditional wash basin and pitcher on mine, but I do have photos of Nanny, Coach’s grandmother, and some McCoy pottery she left us when she passed away. On the bottom shelf you’ll find all of my photo albums, which have lived on that washstand for my whole marriage. I’m such a creature of habit! (Here’s the closest washstand I could find on Etsy, at a really decent price! I couldn’t find the McCoy pitcher and bowl like ours, but here’s a similar set). I like to add little touches of vintage everywhere here at Big Creek. Some pieces have been here as long as the house, and some have been brought in through the years by antique lovers before me. I’m not sure where this old washboard came from, but I sure do love it on my back porch! I also love it because I don’t actually have to use it! I think that’s enough for today. I really could go on and on showing you our country antique decorating style, but there’s plenty of time for the rest later. If you’ve learned nothing else, you do now know that our home is FULL. We really don’t have room for even one more piece of furniture. Sure, it’s a little crowded, but we love all of these vintage pieces, and each piece has a purpose of some sort. If you’re shopping for your own country antique decor, be sure to click the links and head on over to Etsy to browse your options. Some antiques are few and far between, but it’s not hard to find any number of vintage goodies on Etsy. If you click a link that takes you to a sold out item, just pop into the Etsy search bar and type in what you’re looking for. You won’t be disappointed! You should do a post on mine, too. We have so much family history!